Motorola was the first company to bring consumers the cellular phone, the flip phone and a really, really thin feature phone. Motorola never fails to make its presence in Android market by bringing out exceptional devices which are worth every penny you pay for. In 2014, Moto E was a perfect combination for savvy shoppers and first-time smartphone buyers. Motorola provided software updates to this tiny warrior as per the agreement. But there is no news of Android Marshmallow 6.0.1 update for Motorola (Moto) E 2014 also known by its name “Condor“. But no worries, Cyanogen has a surprise package for Moto E users. 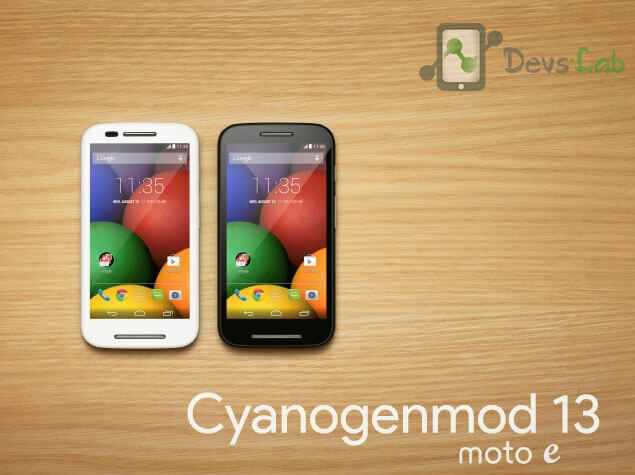 Cyanogen released official Cyanogenmod 13 (CM 13) for Moto E 1st Gen 2014. The best part about this, Cyanogen provides daily software updates that keeps your device updated & free from all the newly released bugs. Check the battery percentage of the phone, it should be at least 30%. This ROM is only for Moto E 1st Gen 2014. Please don’t try this on any other smartphones. To backup all your Apps, use Titanium Backup so that you can restore them later. Turn off / Switch off your Moto E 1st Gen 2014. Press and hold Press & hold Voldown + Power button, it will get you to the bootloader, then select recovery from there to boot into Recovery mode. Do not forget to perform a nandroid backup. Goto backup option in TWRP and select all the partitions including System, Data, Boot, Recovery and swipe right to backup. Next, Goto TWRP main menu & goto Install option. Locate the CM 13 downloaded zip file & tap on it. Now swipe to Install the ROM. From recovery select “reboot”. First boot might take 4-5mins, so don’t panic. As this is very early days I advise not to really use this as a daily driver because of unknown bugs, etc. Just see this as a taster for marshmallow. So in terms of features this is basically pure AOSP at the moment as in what ships with Nexus devices. Moto E 1st Gen Cyanogenmod 13 ROM: Download. I would strongly suggest you to use this on your secondary device as its an Initial build from Cyanogen team, you might find few bugs. However, if you are a CM lover, you can help Cyanogen team improve the ROM by sending them bug reports using the inbuilt bug reporting tool. Till then, enjoy CM 13 in your Moto E 1st Gen.